This dry winter skin tips post is sponsored by Mirum, but all opinions are 100% my own. Thanks for helping me to support the brands I love. First of all, I love winter! But it doesn’t always love me, or at least it doesn’t love my skin! I just got back from snow skiing over the weekend, and the cold weather, low humidity and wind did a number on my skin! I would slather up with lotion and almost immediately my skin would soak it right up and go right back to being dry again! 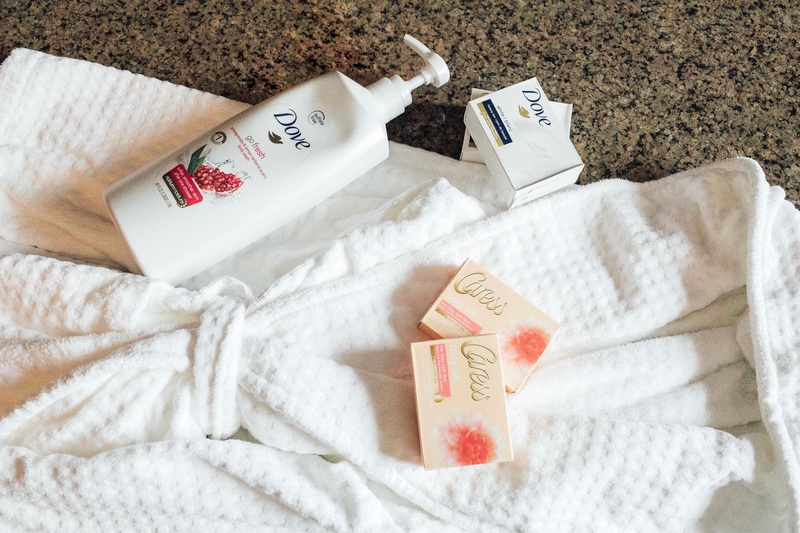 So…I stocked up on some of my favorite products from Sam’s Club – Dove Beauty Bar, Dove Go Fresh Revive Body Wash and Caress Silkening Beauty Bar to help improve my dry winter skin. 1.) Get rid of the harsh cleansers. Sometimes you think to clean better, you need something that really scrubs and cleans right?? Wrong. Cleansers and soaps that are too harsh will actually dry out your skin and can irritate it too. That’s why I use Beauty Bars, not soap. Dove Beauty Bar or Caress Silkening Beauty Bar aren’t soaps. They actually clean gently and add moisture back into your skin. 2.) Moisturize while you’re showering. When your skin is warm and your pores are open, you body can absorb moisture even better. That’s why I use Dove Go Fresh Revive Body Wash. It cleans and moisturizes and adds plenty of moisture back into my skin instead of cleaning and stripping it all from my skin. Bonus, I also love to use it as shaving cream. 3.) Apply a moisturizer after you shower. Look for a good oil based one. And remember, you might need a thicker one than what you prefer to use in the summer. Apply 1-2 times a day. 4.) Apply sunscreen daily. Even when it’s not summer time. Harmful rays can still damage your skin any time of the year. Especially if you’re out in the snow, the glare can cause the sun to really beat down on you damaging skin and also drying it out. 5.) Use a humidifier in your house. This is a must. All that heat you’re blasting in your home right now will dry out your skin, but a humidifier will help add moisture back into the air which will help your skin. What about you? What do you do to soothe your dry winter skin? Let me know in a comment below!! Loving these tips to combat dry winter skin? Click here now for more beauty essentials!! My skin wouldn’t allow me to use bars, but the body washes are my friend, especially the ones by Dove. I should consider adding a humidifier to my house for sure — thanks for that tip. I love the Dove line, and I love how great their products are for sensitive and dry skin! Dove will forever be one of my favs! I love Dove products – I use them all the time and they really do help with dry skin! To be honest, I don’t moisturize at all and my poor skin is suffering from it! 🙁 I need to try that Dove body wash! These are such great tips! I’ll have to try a humidifier. I’ve always loved caress body washes, haven’t ever tried the bars! I LOVE Dove moisturizer! It’s the only one I’ll use! Never think to moisturize while I shower, and tbh, I usually forget to after too!! Always use Dove..it’s my go-to! Ugh, my skin gets so dry in the winter but Dove products always save the day! I always try to increase my water intake and turn the humidifier on! 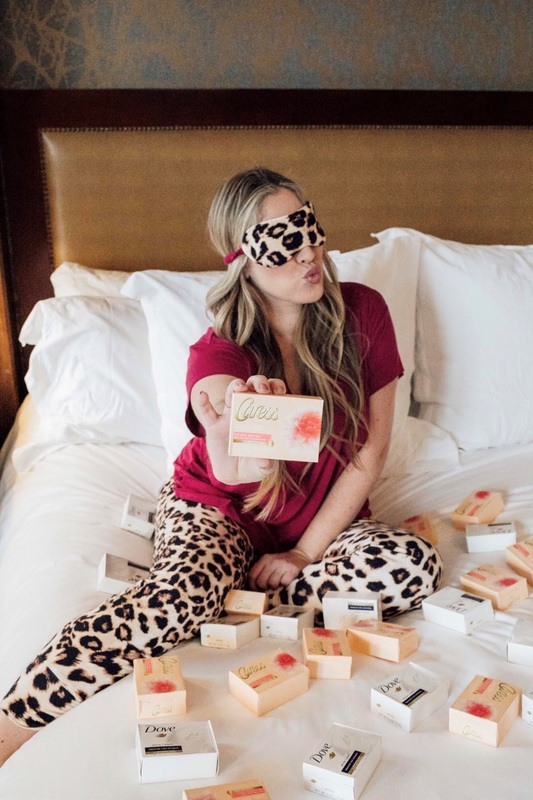 I’ve used Dove since I was little – it was the only soap that didn’t cause my sensitive skin to break out and I still swear by it! Love these tips! I go through SO MUCH moisturizer this time of year, and I think we need a humidifier. Dove is one of my favorite self-care brands. 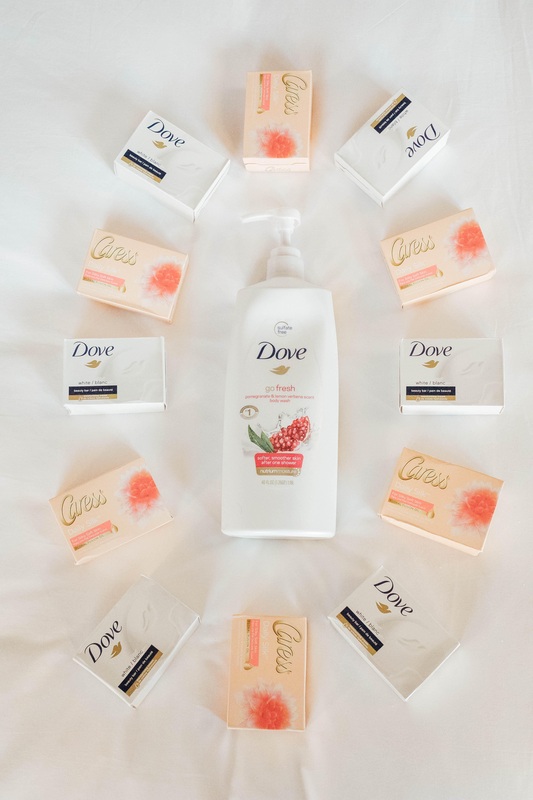 Caress and Dove are my top favorite brands! Their products are amazing. Thanks for all these tips! Never thought of number 5 and it makes a lot of sense. I definitely need to get a humidifier! I have really bad skin in the winter and I have been trying to find everything I can to fix it. This will really help. Perfect timing for this post- my skin has gotten super dry to picking this up ASAP! My skin is SO dry from the winter, it’s horrible! I love all Dove products it’s the only products that help! Yes yes to all these tips! I swear by a good, intense moisturizer and anything with hyaluronic acid in it! Great tips, I live in AZ where it’s so dry so staying moisturized is a must! I have extremely dry skin and I love Dove products. I use the body wash and it really helps.